You know I can't quite resist taking holidays to their extreme...so this heart-shaped Valentine's Day Ravioli from Petite Kitchenesse is right up my alley. Homemade pasta is the perfect choice for an intimate dinner; and leave it to the Italians to know just how to say 'Ti Amo' in style. Throw in a bottle of wine, a couple of candles, and some chocolate for dessert and you will have just the right setting for the most romantic dinner of the year . . .
Preheat the oven to 400°. 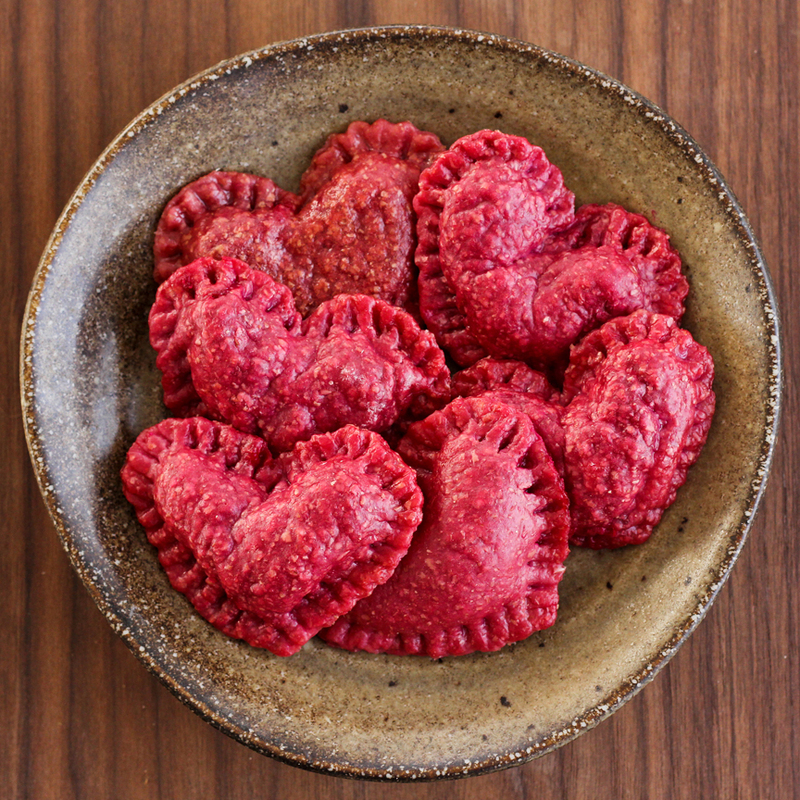 Pierce the beets a few times, then place in a baking dish, cover with foil, and bake for approximately 1 hour, or until beets are tender. Remove from the oven and let cool, then peel. Ready your food processor* with the grater attachment. Chop the beets in half or thirds (whatever will fit), then grate. Switch to the chopping blade. Add a tablespoon or two of water, then pulse until everything is finely chopped. * If you don’t have a food processor, grate the beets, then finely chop them with a sharp knife. Transfer them to a bowl, then add the water and stir. 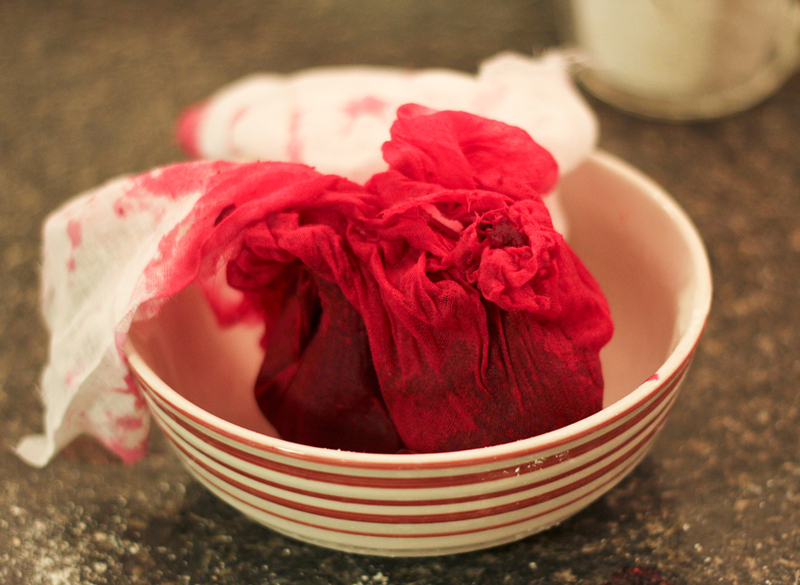 Transfer beets to a piece of cheesecloth. Squeeze the beets over a large measuring cup or bowl, until you have ⅓ to ½ a cup of juice. 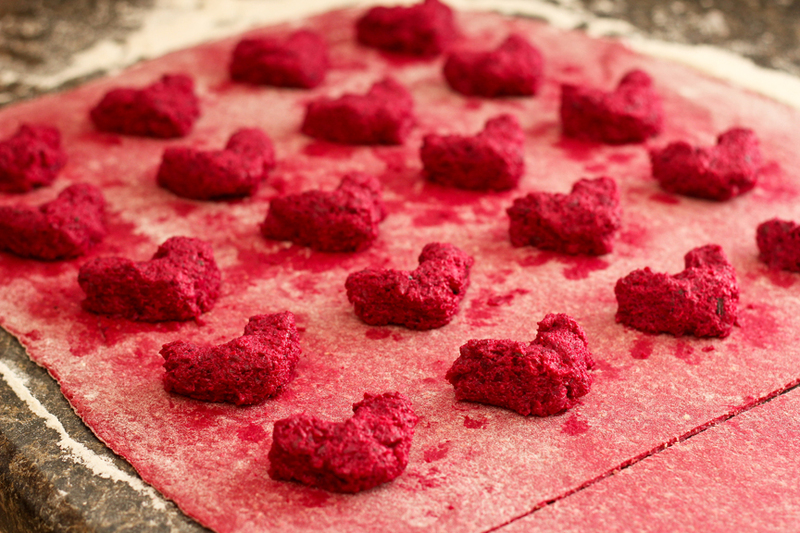 Transfer the remaining beet pulp to a bowl. Stir in the chèvre until evenly-distributed, then add salt to taste. Set aside. Add flour to a large bowl and make a well in the center. Add the yolks and the beet juice, then stir to combine. When you can no longer mix with a fork, turn the dough out on a floured surface and knead until smooth. Roll the dough out into a large, even rectangle approximately 1/16 of an inch thick. Cut the rectangle in half. Grab about a tablespoon of filling (or whatever will work best for the size of cookie cutter you’re using) and mold it into a heart shape. 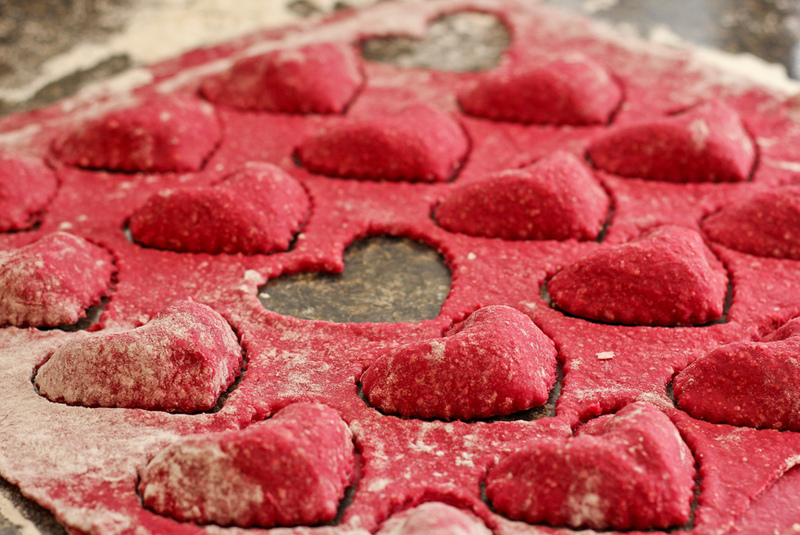 Arrange filling hearts about an inch apart from each other until you’ve covered half of the dough (there should be some filling left over). Dot a little bit of water around the edges of the filling, then place the other half of the dough rectangle on top and press to seal. Using your cookie cutter, cut out each ravioli. Pull up the dough trim from around the ravioli, knead until the smooth, then cover with a damp tea towel or plastic wrap and set aside. 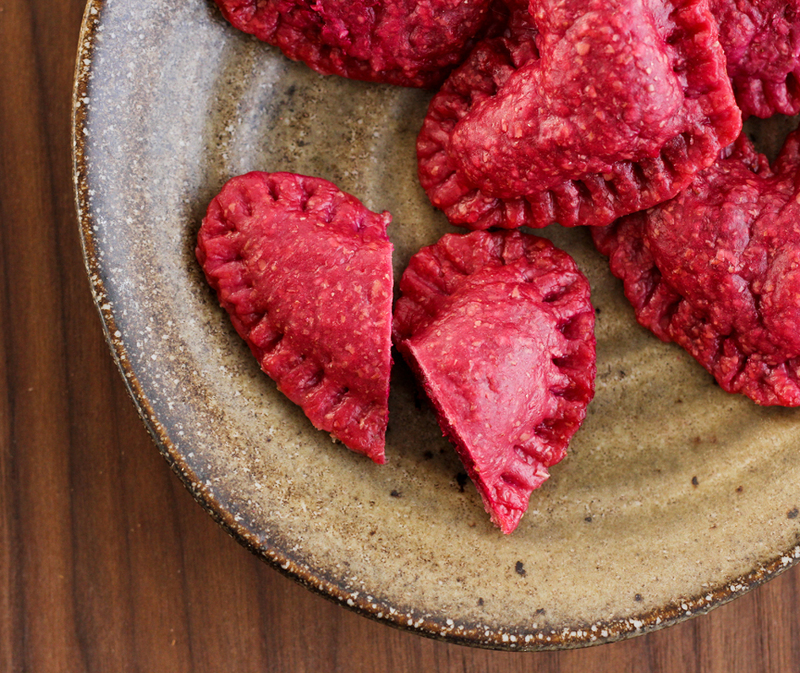 Gently remove each ravioli from the counter (they may resist a little, depending on how sticky your dough is). Press around the edges with a fork to seal, then transfer to a parchment-lined baking sheet. When you’ve finished, reroll the remaining dough and fill with the remaining filling. 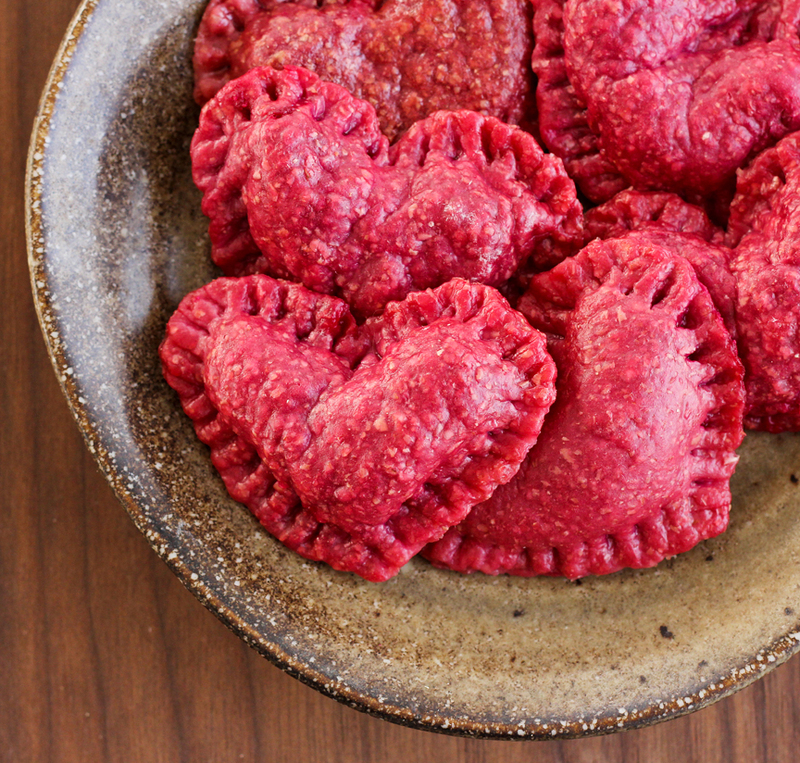 A Special Note from Carey: One of the issues that I discovered while preparing these for today’s photoshoot is that the beautiful bright red color of the dough tends to leach out into boiling water. I actually decided to try steaming a second batch, just to see if they’d hold their color better. 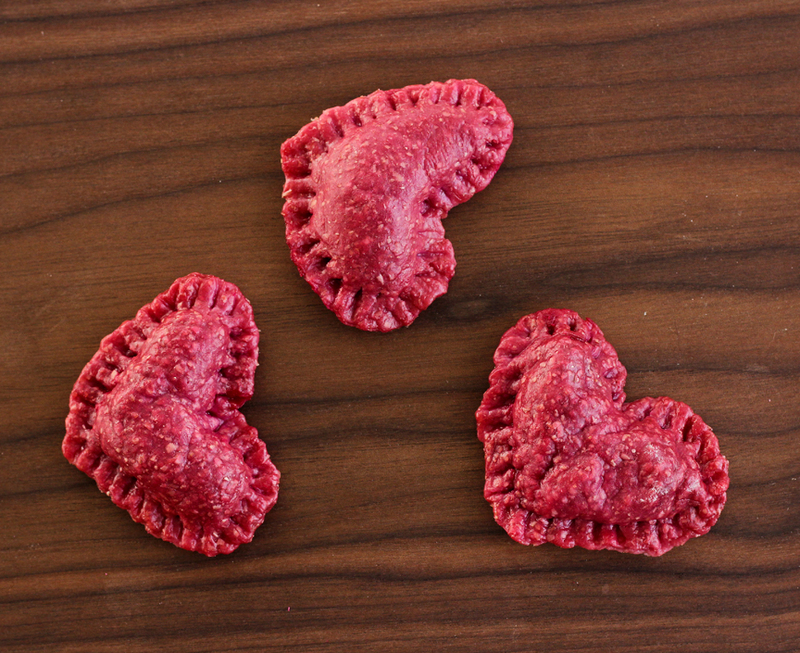 The result was a slightly brighter ravioli, but they were also a little bit chewier and not nearly as good. Then several hours after this post went live, I received some great advice from Gerry over at Gewoon Lekker Gewoon. She’d made a similar dish last year, and experienced the same disappointment of beautiful red ravioli that had turned an icky washed-out mauve color after cooking. Her solution: boil them in beet juice! 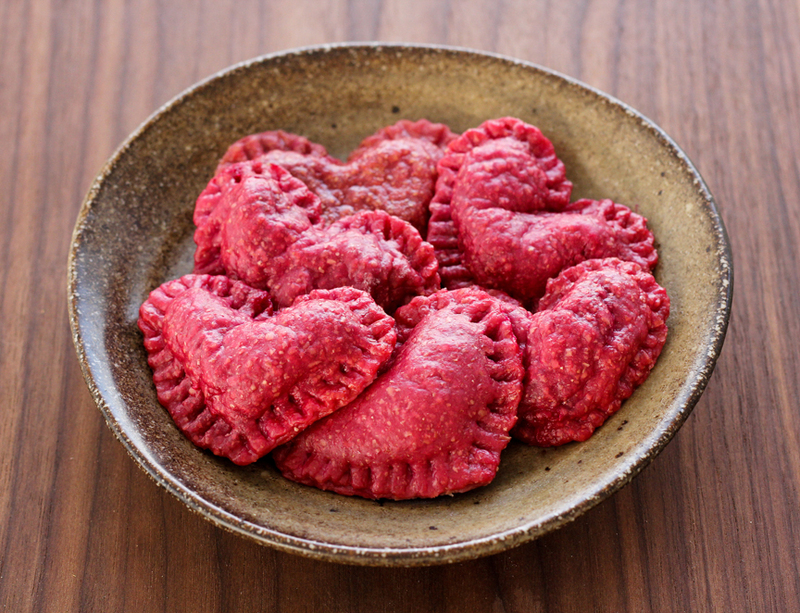 If you’re going to juice the beets yourself, you will want to do so right before you’re ready to cook the ravioli (as Gerry mentions also dealing with less-vibrant juice from the day before). If you don’t have access to a juicer, getting enough beet juice for boiling is going to be a bit of a pain. 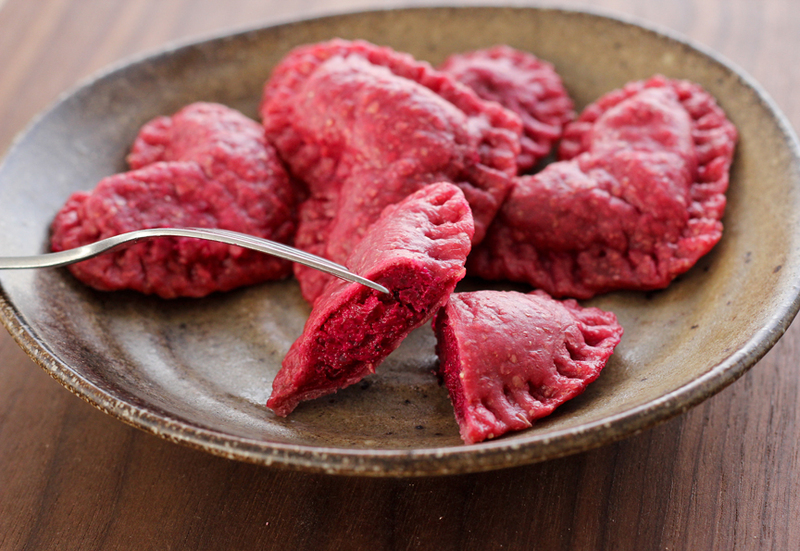 I’d suggest getting as much juice as you can out of some beets, then mixing it with just enough water to cook the ravioli in. And if you don’t want to go the beet juice route at all, just keep a careful eye on them while boiling, and remove them as soon as they begin to float. Bring a large pot of water to a boil. Add ravioli and boil until they just begin to float. Now normally, I’d suggest pan-frying these in a little bit of butter after they’ve finished cooking, but that may also detract a little bit from the color. If you keep a close watch and only fry them for less than a minute on each side, they should be fine. If you don’t want to risk it, then just serve them as is (and maybe garnish with some parmesan or poppy seeds).